Years ago, I bought my first set of oil paints and took a few painting lessons from Aunt Barbara, my mom's sister. The small town of Twin Falls, Idaho where I was born and raised is not exactly the art capital of the world. My first recollections of viewing paintings were at the art building of the Twin Falls County Fair each fall. From those humble beginnings in art, I have been blessed to grow and progress, and since 1986 I have supported my wife and family of nine children solely from the sales of my oil paintings through galleries across the U.S.
To me, simplicity is elegance. I paint exclusively in oils, using two brushes and seven colors plus white. My representational/impressionistic paintings are done on hand-made custom contemporary box canvases with no frames, which have become a trademark. I work on one painting at a time, as quickly as possible, so that I'm always working wet oil into wet oil paint. Most of my work is done in-studio using my own photographs of landscapes, gardens, clouds, and deserts I have visited as references. I enjoy creating large artworks, many of which are 40”x50” and larger. My largest single panel painting so far is a 60” x 144” commission of the Boulder Mountains of Central Idaho for Key Bank in Boise, Idaho. My largest multi-panel work to date is a 75”x125” five-panel wildflower garden. In a world that seems increasingly complex and unsettled, I strive through my paintings to convey grace, elegance, quality and beauty. McDowell Sunset from Philip Chesley on Vimeo. John Horejs began painting in 1973. His art education has been acquired through self-directed, independent study. He has studied with Sergei Bongart, Michael Lynch, Jim Wilcox, and Olaf Moller. John works exclusively in oils. His style is a blend of realism and impressionism. He uses many of the techniques of the impressionists, but applies them in a more controlled, realistic manner. Favorite subject matters include wildflowers and gardens, western mountain and desert landscapes, and skyscapes. John’s palette consists of only seven colors and white. From these basic hues he creates a kaleidoscope of rich, wonderful color that has become his trademark over the years. John and his wife, Elaine, have been married since 1973. They are parents of nine children, and grandparents of twenty (so far). 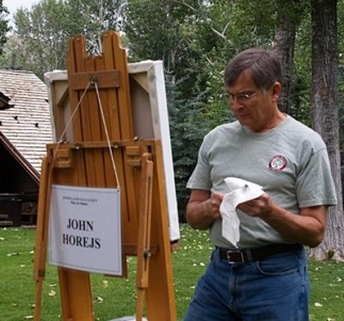 John Horejs paintings have been exhibited in national juried shows including the 1983 and 1985 Annual National April Salon, Springville Museum of Art, Springville, Utah. In August, 2007, John's landscape “Glory of Autumn” was acquired by the University of Montana Museum of Fine Art for the University's permanent collection.